Summer time gluten-free pie recipe from National Foundation for Celiac Awareness (NFCA) Volunteer Annette Marie of Best Life Gluten-Free. Summertime means pie! New Jersey, my home state, is the nation’s largest grower of blueberries. And you know what that means? We get ‘em fresh and in abundance! 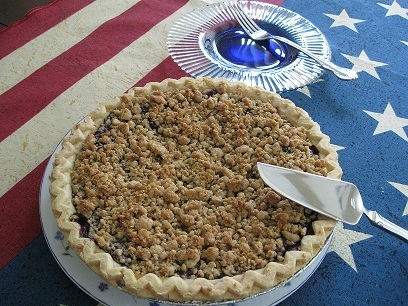 There’s a Blueberry Pie recipe on my blog already, but this one is slightly different; it’s semi-homemade using prepared Gluten-Free Pie Crust from Whole Foods Brands, and of course, it’s sporting a crumb topping. I love this one more than my first blueberry pie recipe…the crumbs get toasty and have a nice “bite” to each mouthful! And it doesn’t hurt that it was less work. HaHa! The first thing you need to do is prepare the dough for the Crumb Topping. Combine the dry ingredients for the topping first, and then add the butter, “cutting” it in with a pastry blender tool or 2 forks. Now add the wet ingredients and combine, using the pastry blender or forks, and eventually with your clean hands, until you have a ball of dough. Wrap in plastic wrap and place in refrigerator for 45 min. to 1 hour. In a saucepan, place half of the blueberries over low heat. As they begin to warm and then simmer, mash with a potato masher or anything that will crush them. Keep simmering until they’re reduced to half of the amount you began with. Stir well and keep an eye on them. Remove from heat and place in a bowl to cool for about 15 minutes. In a larger bowl, place the remaining ingredients, including the other, raw blueberries, lemon zest & juice, salt, cornstarch. Add the first berries and combine well with a spatula or wooden spoon, folding under as you combine well. Pour in the pre-made pie shell and dot with the teaspoon of butter (separated into 4 tiny pieces) scattered about the top. Remove the chilled ball of dough, unwrap and place in a medium sized bowl. Using the pastry blender tool or forks, create crumbs. What we’re doing is crumbling the dough until the tiny balls of it are about the size of peas. Sprinkle all over the berry mixture.Here’s a photo of the raw pie at this step. Place the pie on a baking sheet (this promotes even distribution of heat and helps the bottom crust bake) and then place in that 400 degree oven on the lowest shelf for 20 minutes. Then, reduce heat to 350 degrees and bake for another 45 minutes. The crumbs should be a golden color and rim of pie also golden. Cool the pie on a rack for at least 2 to 2 ½ hours, before serving. I use a pie “protector ring” on my crust so it doesn’t burn. These are available at most kitchen specialty shops. Here in the Northeast we have “Bed, Bath and Beyond” where I got mine! If the crust seems to be getting too brown, you can even cut a few strips of aluminum foil and make your own protective cover for the rim. Don’t cover the whole pie, just the outer crust. Hope you like it. I love this and have to force myself to stop eating it! But then again, we do have a major sweet tooth in my family!